On a hot day, too hot for the hills, where else to go but the Scottish Riviera? 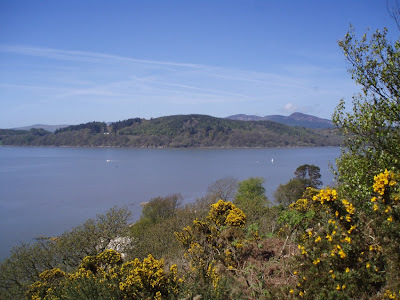 We arrived in the pretty village of Rockcliffe for a walk, having had a big cycle round Dumfriesshire and a daunder up Criffel the day before. This was to be a day of relaxation, sunshine and crowds, and we slapped on the sun cream in a shady car park, already full. Rockcliffe is a secret that everybody is in on, a small haven bustling with weekenders and holidaymakers. With three caravan sites within a 4km radius, you might think the village would be ruined as a result. 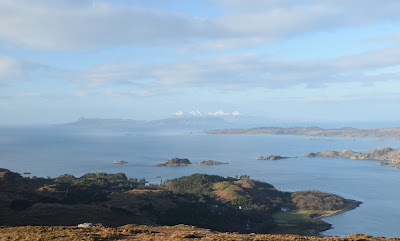 However, it has little in the way of facilities and somehow, despite the tourists, retains its peaceful village atmosphere, everyone making their own entertainment, down on the small, rocky beach or pottering about in small boats offshore in the sheltered Rough Firth. 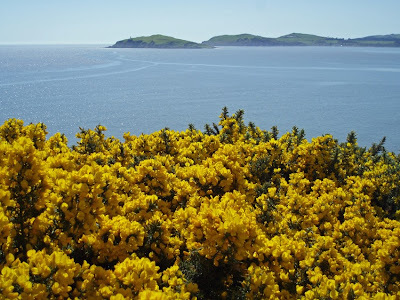 Only a mile from Rockcliffe lies another pretty coastal village, Kippford, slightly larger and boasting a village shop. 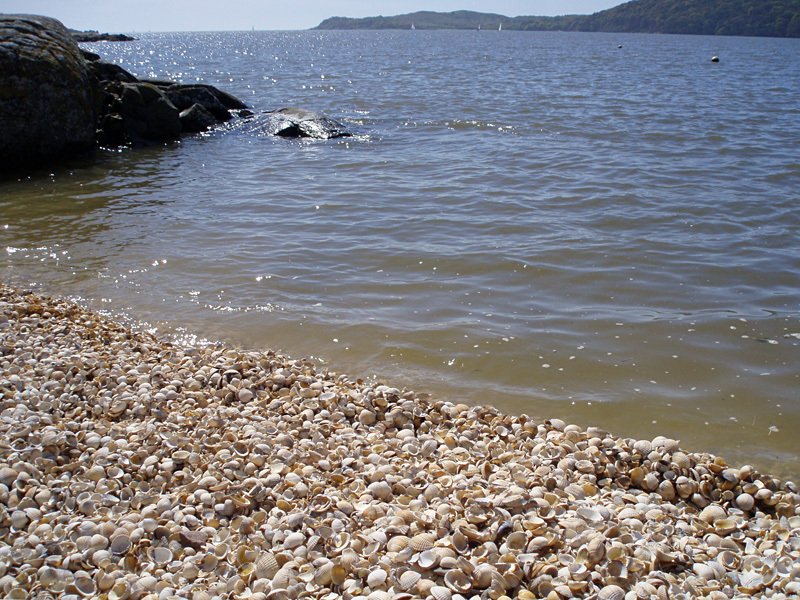 We walked along the coastal path between the two villages, enjoying a picnic in a sunny glade, emerging at the Kippford end at a beach made entirely of cockles. Kippford today is a whitewashed town of artists and tourists, strung along the narrow shore between the muddy Rough Firth and the low wooded hills behind. The firth is attractive at high tide but miles of oozy mud are exposed at low tide, the boats moored at Kippford sitting on the mud at crazy angles. There are no miles of golden sandy beaches and the scenery is not dramatic, yet this shore is a sheltered suntrap and there is a feeling of rightness. There is an art gallery, and a sculptor lives at the end of the road that greets walkers arriving from the Rockcliffe coastal path. One of the sculptures stops you in your tracks and in the middle of a sunny, beautiful day drops you down a deep, dark historical hole. It stands at the waters edge, a small figure of a female made of wood with red fishing net hair, chained to a post. It is a memorial to the Wigtown Martyrs, two Covenanters, Margaret McLachlan and Margaret Wilson, who were judicially murdered on 11 May 1685 for refusing to swear the Episcopalian oath recognising James VII as the head of the church. (For Covenanters, God was the head of the church.) Their mode of execution was to be novel: tied to stakes in the Solway firth and drowned as the tide came in. Margaret McLachlan, the elder woman, was tied further out, in the hope that the younger woman would be terrified by the sight and swear the Episcopalian oath. But she did not. Margaret Wilson was eighteen years old. On the way back from Kippford to Rockcliffe, we took the higher path through the woods. "Watch your feet!" I said to my companion. 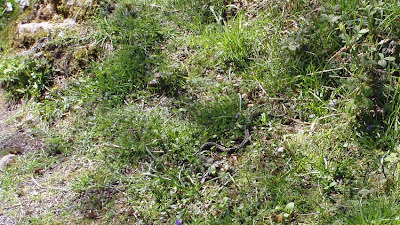 She had unwittingly stepped right over an adder, sunning itself on the path! Higher up, the path opens out onto a 6th century hillfort, the Motte of Mark. There is nothing to see anymore of the fort, but it remains a great spot to see up and down the coast. Below us lay Rough Island, accessible at low tide by a causeway. This area was renowned for smugglers in the 18th century and there are plenty caves as well as tidal islands. Have you ever read the Famous Five books? I know that Enid Blyton is supposed to have set them in Devon, but there can't be a better prototype for Kirrin Island than Rough Island. 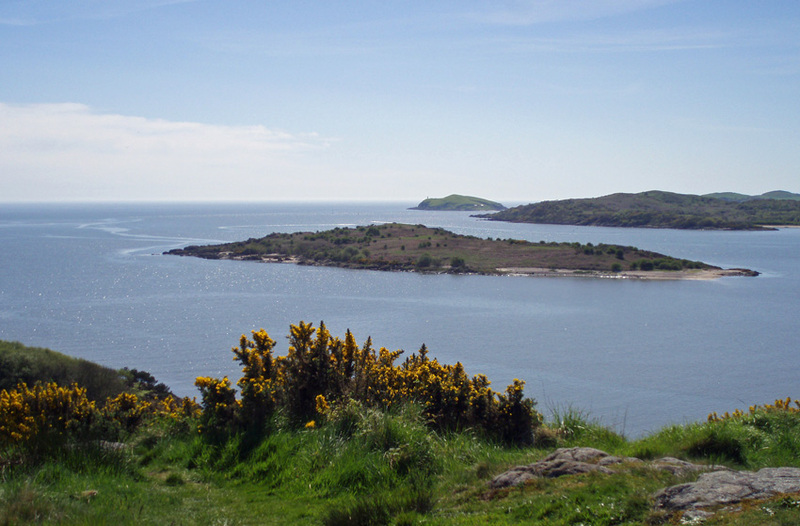 For letting children run wild and free, the Rockcliffe and Kippford coast must be a better fit for 1950s Devon than the Devon of today is. Nice area. Not been down there for a while. Adders seem to be more numerous in the south. Northumbria is full of them. I love Scotland too. Great blog!